I love raising rabbits for meat. That’s right, Ladies and gentlemen, we’re back in the rabbit business! Lord have mercy! Hallelujah! Can you hear angels singing? Can you see the rainbows shooting across the sky? Is it currently raining gumdrops and lollipops where you are? … and is it just me, or do I smell fresh bread coming from the oven? Yes. Being back in the rabbit business is that good. Gooder than angels, rainbows, gumdrops, and fresh bread. And yes. Gooder is a word. I looked it up. … okay fine, that was a lie. It’s not a word. But let’s not focus on the small details, people. The point is simply this: We’re back at it! And our rabbitry is once again in full swing. After leaving Alabama two years ago, we had to part with our wonderful rabbits that provided us with meat. That was a rough one for me. I loved my rabbits and told them so by picking them fresh weeds from our neighborhood each morning with my (then much smaller) children. As much as I begged Stuart to somehow bring all 15 of them back with him in the van he was about to drive 2,700 miles back to Washington, we ultimately had to leave them behind in ‘Bama. And since then, I’ve been eager to get my rabbitry back up and running. Even though it can be emotionally difficult to butcher rabbits, or any animal for that matter, the wonderful meat, compost, and fur is worth the effort. 1. They fatten on grass. Grass, people. Sustainable. Easy to grow. Easy to store. Inexpensive. In fact, most of the year, they can just be fed on weeds I pull up from the garden, a variety of old leaves and such from the garden, and wildflowers. No grain. No alfalfa pellets. No money. They breed… like… ya know, rabbits. Remember the rabbit mamba? It’s a productive dance, my friends. Rabbits have around a 31 day gestation, which is incredible considering they can produce anywhere from 1-15 (or more!) kits from each pregnancy. And when you’ve waited patiently for five months to welcome a new sheep into your herd, only to have that same lamb die a few days later, the 31 gestation starts to sound pretty dang sweet. Let’s not even talk about Calf Watch 2015 that is currently underway (… that story began almost 10 months ago). Many farm pregnancies last for awhile. 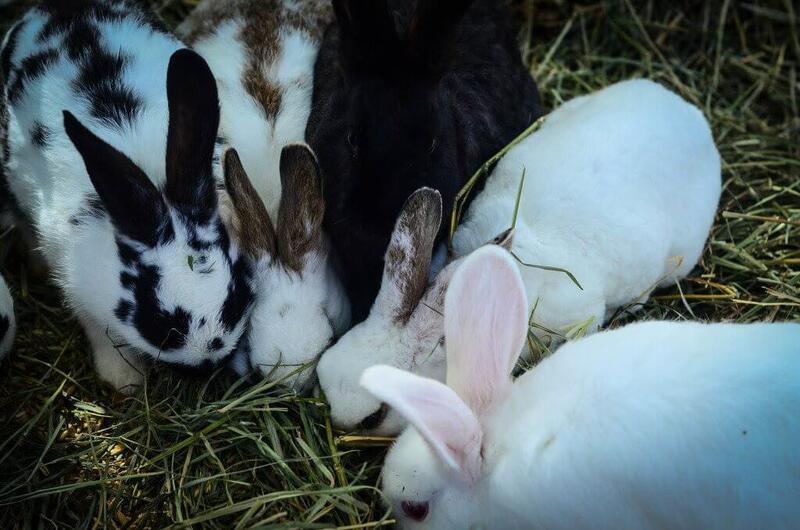 Rabbits’ pregnancies are not one of those. 3. The meat is wonderful. Rabbit meat is incredibly lean and is a great combination to raise alongside pork. Pork is fatty and when you harvest your own pigs, it leaves you with a variety of fats (some in the form of bacon!) that are wonderful to pair with rabbit. Leaf fat, lard, caul fat, pork belly, etc. are all wonderful contributors to a rabbit feast. Rabbits are great roasted, baked, fried, braised, and boiled. Because rabbit is so lean, it does well with some fat added in whatever form that may be. Don’t tell me you don’t like rabbit. Just don’t. Because chances are you haven’t had it. And if you have, then it’s time to try it again. Because while it doesn’t taste exactly like chicken, it is a very comparable meat and is much more sustainable for the small homestead. I love our meat chickens and will continue to raise them (if only for their feet! ), but rabbits are a great way to temper our chicken eating. Watch out chickens. There’s a new white(ish) meat in town. We currently have one buck. Named “The Buck”. And two does named “The Does”. Creative, I know. But I keep naming animals and then they die, so I’ve given up. From now on, we’re sticking with purely biological names. “Big doe” or “Spotty doe” are as creative as I’m going to get. Our rabbit run is still in the works (hello, flower boxes), but besides the basic waterers and feeders, it’s finally complete. The 16×8′ area is fenced off with picket fencing. A rabbit-gauge metal fencing lines the inside to keep them from squeezing through the pickets. The does are theoretically supposed to be separated into the different pens within the rabbit pen, but have since figured out how to climb through said rabbit fencing (who designed this stuff?!) and a bit of mending is in order. I’m not too worried about it at the moment, as they’re all happily living as a community amongst themselves. Lil’ ol’ rabbit community. How precious. …until we take the little ones and butcher them for supper. But again, let’s just not focus on the small details, yes? …and speaking of rabbits, it’s actually time for me to head out and encourage a little love-date for the buck and a doe. Now that her kits are weaned, it’s time for more littles! Sustainable. Quiet. Easy. Prolific. Delicious. What do you use for recipes? We tried cooking rabbit, but couldn’t see the benefit compared with the ease of chicken. Just use a lower heat and plenty of oil as not to dry ’em out. The Elliot Homestead has been my daily reading. Shaye is awesome at what she does! This post is in perfect timing! We have been considering adding rabbits to our farm but didn’t know the logistics. One question: how old are they when they are butchered? Depending on the breed rabbit’s can be butchered at 8 to 12 weeks of age. Good records and weighing live and slaughtered carcass will tell you the best time for your particular breed of rabbit. Best Wishes ! ! ! 2 months after their born and you wean them 2 more and you butcher. I’ve been waiting for this post since you posted on Instagram that you had rabbits again. I’ve been (not so) patiently waiting for our meat rabbits to join us, but alas they keep getting pushed to the back burner as far as animal purchases go. For now I’m living vicariously through you, and pinning too many rabbit hutch/run ideas. We have a few projects like that too that just get pushed to the back! How many pounds of meat per rabbit? We want meat on our homestead (right now we only have veggies, fruits, and laying chickens…) we want pigs, because they sounds “easy” but rabbits sounds “easy” too, is this true? Yes, they are! I like that pigs give you such a bigger harvest. But I love that rabbits are small and easy and if something happens it’s not such a huge loss. How can one choose?! I just… I feel like I’m too much of a tender heart. I gotta get farm tough! And also- rabbit recipes? Got any? i live in the burbs, but my husband and I are starting to put a plan together to start a farmette out in the country. For now I grow veggies and we thought rabbit might be a good way to start raising some meat on our small lot. 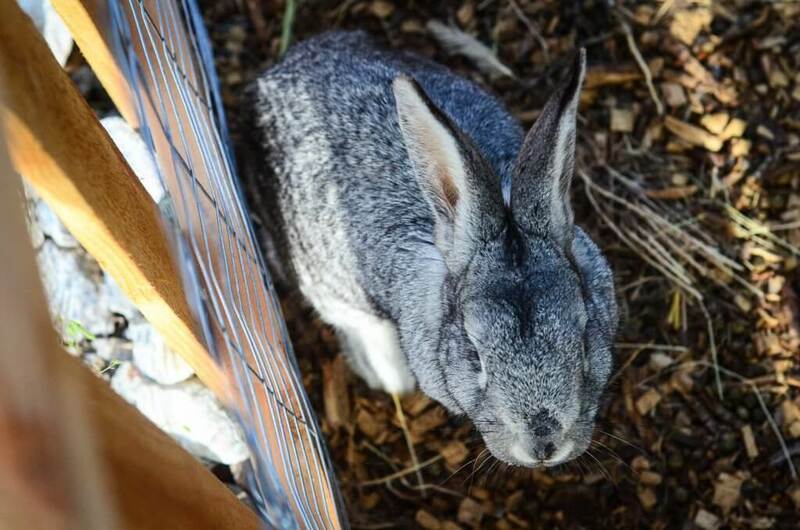 I would love to see pictures of your rabbit enclosure. I’m not keen on those little rabbit cages and your setup sounds nice. The other thing I was curious about is how much of your food are you able to raise. What things do you still buy at the grocery store? I’ve kept several pet rabbits and currently have a free range house rabbit. We bought him with the intention of breeding rabbits for dog food (with 6 dogs, we spend a lot on food), but being the soft-hearted vegetarians that we are, 5 years later he is still with us. Well done. 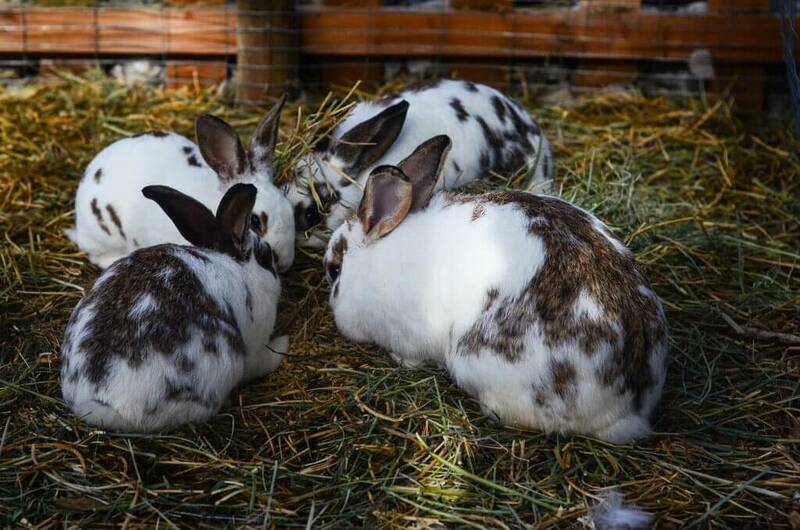 I keep free range rabbits too….. they are part of the family. Couldn’t imagine eating them any more than eating the dogs. I’m also interested in what you do with the fur. Our first litter is (we hope) due in 11 days. (I wish I had known about your mating video beforehand!) I guess I have romantic visions of soft rabbit fur mittens and whatnot, but don’t want to use a bunch of toxic chemicals to preserve the hide. I am just beginning to explore but since you mentioned the fur as part of the plusses of rabbits, thought I’d ask you. We did our sheep’s hide with salt which was great. We haven’t done our rabbits yet but I’ll report on it when we do! I’ve tanned rabbit and squirrel hides many times a few raccoons and a couple groundhogs. The groundhogs were probably the nastiest because of the Grease. It’s very simple you clean the flesh side down to the just skin and then Alum and salt. Roll them up flesh side in and it takes a few days to a week and a half when it’s white all the way through you’re done give it some oil and stretched a little bit to make it limber. Love rabbit, it’s probably my favourite meat. I’d love to keep meat rabbits but we have fields (and often a garden!) full of wild ones! Do you think there is a big difference between wild rabbit meat and raised rabbit? Would you still raise them yourself if you could get as much wild rabbit as you wanted? No. They carry diseases. Unless you know they do not have any. But I recently had a friend who did this just to help lower the numbers he had and got sick because they were carriers of something. (Sorry I forgot what it was called) he was in the hospital for a week. We then found out he wasn’t the only one, and it wss in multiple states. I find it better to just raise your own and know what your eating. No. I’ve hunted and eaten wild rabbit for 30 years. Every states fish and game will have a listing for what’s safe to eat and what’s not. Where do you hunt? 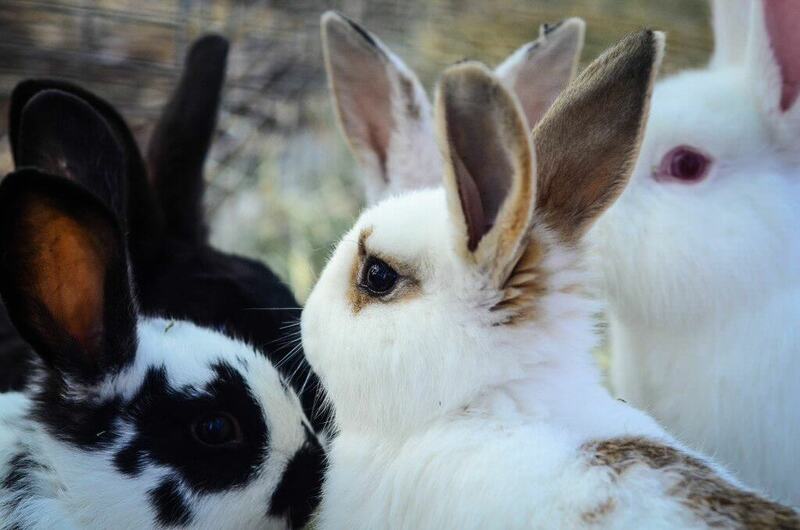 I offered a friend in Arizona an opportunity to help shrink the rabbit population on her property – I have four dogs. They would have been happy to have the catch. She and her son both told me that the local cotton tails were carriers of a disease, and therefore offering the meat to the dogs would be a bad idea. Shaye, want to know your thoughts on rabbit breeds for meat and what you guys think/have. Funny thing…I paid for my Californian rabbits yet my best meat bunny produceping mama happens to be a free Craigslister, my mini lop! That’s some craziness right there 😉 love your posts! Right now we have Chinchilla rabbits and some sort of weird Rex cross? Haha. I call ours meat mutts! WHATEVER YOU DO – DON’T NAME THEM! I knew each one by name even in the freezer! Been raising rabbits for over a year. I love it, but it’s a learning process. Like, timing of breeding – had 26 kits born in a 24 hour period by 3 does last year, & all survived and thrived. Learned not to breed brothers/sisters offspring. Does have no maternal instincts and lost 18 kits recently, still grieving that loss and the brutality. Sent does to freezer. Two new does and one delivered 8 kits last Friday. Most protective mother ever! Love the babies. And my garden is growing madly from their rich poop. Such goes life on the farm… so much to learn! Have you made sausage with rabbit and pork? It sounds like you have from the post. That’s the next step in my rabbit raising. I’ll have to buy my pork fat, but raising rabbits is so fun and easy (in comparison to all of the other animals I’ve raised in my life), plus, when you raise pure New Zealand Reds, you can replace “Pickles” the pet three times and daughter doesn’t even notice. Any information or links that you can recommend for rabbit/pork sausage would be greatly appreciated. I haven’t but that would be fun! You’d definitely need pork fat for sure, but other than that, I don’t see why it wouldn’t work! We had rabbits for a few years. Very easy keepers but alas was not a fan of the taste. This is a great post! I’m a little confused though, at how old do they start reproducing? I really know nothing about rabbits (obviously), but it seems that if you keep the buck separated so that you can schedule when breeding goes on, what happens when the momma rabbit has boys and girls. Do they take several months to reproduce and you butcher them before they get that mature? In my small mind I just see hundreds and hundreds of bouncing fluff balls reproducing madly every month…. Yes, they are butchered before they can sexually reproduce! Do you move them to fresh grass? Is there a bottom to your area? Do they dig out? I ask bc our meat rabbits are in wire cages off the ground. We pick grass and give it to them but I would love to get them down on the grass. Just worried about them digging out. We don’t have a system for that yet… I’m working on establishing a fodder system for them. We have wire along the bottom of the run because THEY WILL dig out. Do you have to keep them cool? Came across your blog searching “Homesteading Rabbits”. We live in a small town in Indiana and just started our own rabbitry. I appreciate your thorough posts (I clicked through on several links). I think I’ll keep tabs on what you’re posting as I feel I may learn some things. Thanks again! I love rabbits. I’ve been trying to breed them for a year, but I’m having a horrible luck. I’ve read most of your blog and you always say that chickens are stupid, but girl, my rabbits are the worst! One got intoxicated with Aloe, other got stuck in a block and just died, at least two escaped from the run and got eaten by the dog. And now another escaped, and the dog was nice enough to not eat it. But I’m a slow person, too tired from a day of work, the man of the house is playing soccer and I’ve been chasing that little monster for two hours now and just want to sit and cry. Thought you will understand. This is so hard and I haven’t even eaten one rabbit. I totally get why people don’t do this and just go to the market. I,m in Australia, have breed rabbits. but now where I live, if I go away, I have no one reliable to look after them. so relucently I don.t breed any more. crumbed, steam pieces or pressure cook then crumb& fry. bake whole with stuffing, fresh breadcrumbs+egg+ onion+mixed herbs. can also add dried chopped apricot. (no water as egg binds). they are very easy to care for, & can inoculate against mixo(not in aust though) & calicie virus.they are killers in Australia. foxes are also a problem in aust. I manager a rabbit farm years ago, foxes got into shed over night & pulled their legs through the cages, plus they died of fright.heart breaking !! First….I came across your blog recently and I love it! We ventured in to raising rabbits last year. We spent way too much money getting started but we really enjoyed it. When it was time for butchering we were a little freaked out because most of the rabbits had white spots on their livers. We ended up getting rid of it all. I want to start over this year. Did you ever deal with that? I read that it was fine to eat the rabbit just not the liver but eh…just seemed weird. Join the Backyard Meat Rabbits group on Facebook – tons of people there with much more experience than me who can offer some words of wisdom! Shaye, I love your sense of humor! We’ve been raising meat rabbits for about 3 year. A personal favorite is “Rabbit Wings”. Prepared just like honey BBQ chicken wings. We save the front legs just for this treat. A second amazing way is in the instant pot. Just some seasoning and water. Just be sure to let the pressure decrease on it’s own the meat will fall off of the bone. Talk about gelatin broth!!! 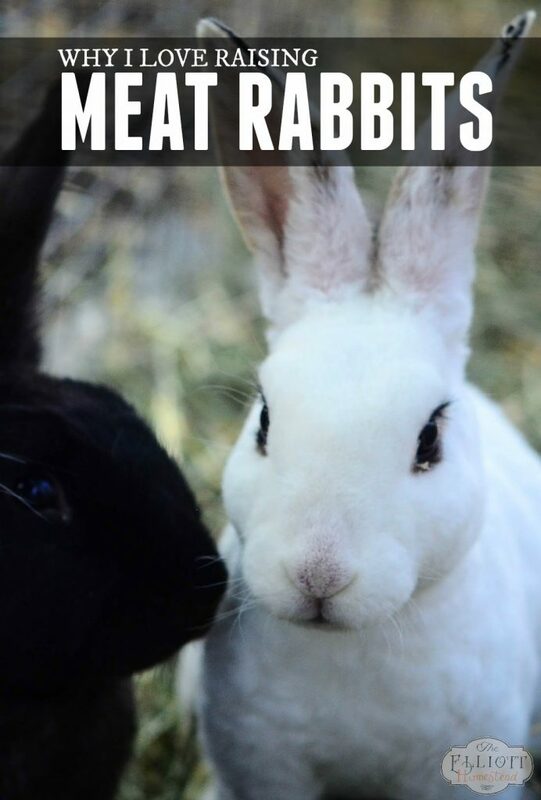 We love raising meat rabbits too!! I got a good chuckle out of your “creative names”, we let our daughter name our the first brood; the girls are Sweet-Sweet and Jump-Jump, our boy is Bun-Bun. We are still working on the best cage set up for ours, it has changed over time to allow for easy cleaning and the best protection from the climate. So many people just can’t believe that we raise rabbits to eat. Yes, they are hard to process but like you said so is any animal. If it wasn’t difficult to do I do not think there would be as much appreciation towards the animal for what it gives us. We are proud homesteaders, we love our way of life and hope grow and continue onward. You say you don’t use pellets for your rabbits, just grasses, weeds, kitchen scraps and hay. Do you find your rabbits grow well without pellets? Do you still offer some pellets? I’d love to raise completely pastured rabbits, but I’ve never heard of anyone raising them without some pellets. 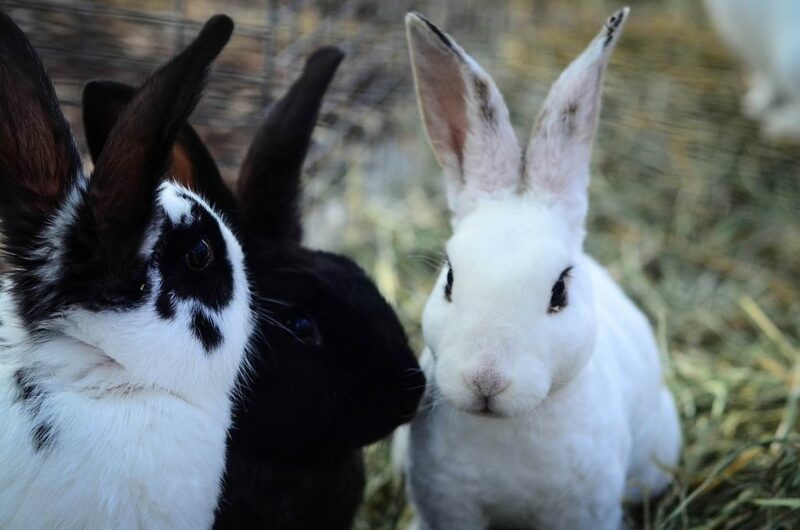 Hey nice blog… considering raising meat rabbits but sounds easier than it is. I guess what isn’t. I have recently viewed documentary on farm raised salmon. The toxicity apparently comes from the protein in the pellets. Did you ever read content list on rabbit pellets or dog food labels. Evidently they spray a pesticide into the protein blend [which consists of emulsified fish carcasses after the fillets are remove of which includes fins, head, etc and fish can be raised in unclean H20]. This pesticide is banned in many countries….. This is why I liked your idea of a no pellet diet as whatever your animal is eating….. you are eating!